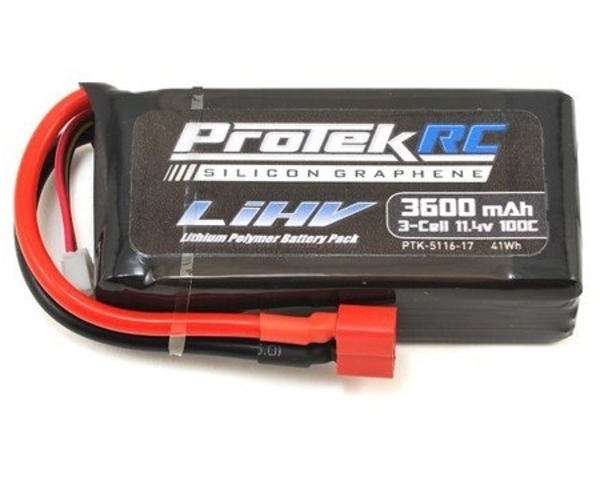 The ProTek R/C 3S 100C Silicon Graphene HV Shorty LiPo Battery was developed specifically for 1/10 scale rock crawler and rock racer applications. 3S packs that are commonly used in the crawler world are either small, low capacity packs - or large, heavy 4000-5000mAh packs. This 3600mAh battery fills the void and gives scalers a higher capacity option that produces more voltage and longer runtimes than a 2200mAh, yet only weighs approximately 20 grams more! Plus, when charged at LiHV specs this battery produces 13.05V, instead of the standard 12.6V of a fully charged standard LiPo, meaning U4 racers can take advantage of the light weight, and higher voltage throughout the discharge curve to give them a more consistent power delivery with less fade on the track!